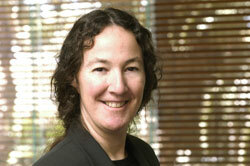 Dr Karen Manley, a Queensland University of Technology based researcher has been named National Project Manager of the Year in the 2008 Australian Institute of Project Management Achievement Awards. The announcement was made during the awards dinner of the AIPM National Conference held in Canberra, 12-15 October 2008. Karen was recognised for her outstanding management of the Construction Innovation’s BRITE Project. BRITE, which stands for Building Research, Innovation, Technology and Environment, was a highly organised and successful project promoting a pathway to innovation for individuals and companies in the construction industry. Construction Innovation CEO Professor Keith Hampson praised her for the award, stating “Dr Karen Manley is a leader and mentor in the Construction Innovation research community. We highly commend her work and take pleasure in the news that Karen has received this level of recognition from the AIPM”, he said.